That whole Paris thing was so all the politicians could get a Paris vacation on the taxpayer's dime. One big scam after another... propagated on a scam in the first place. The biggest hypocricy is that whatever any of these con artists agree on, the results are officially "NON BINDING". In other words fuggedaboudit ! 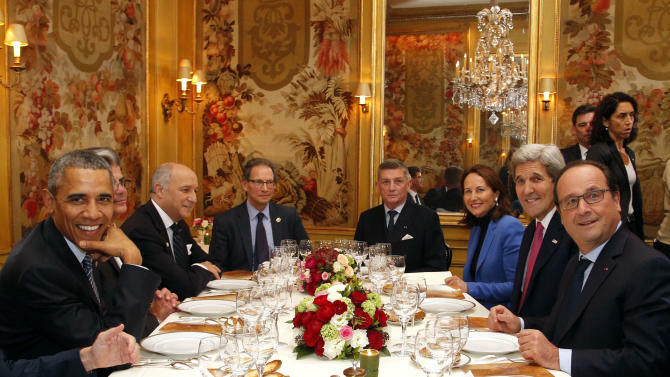 As working dinners go, President Obama’s meal Monday night in Paris with French President Francois Hollande, Secretary of State John Kerry and others wasn’t too shabby. No cartons of takeout — instead, the gang fueled up after a long day of climate talks at L’Ambroisie, the three-Michelin-starred temple of gastronomie in the Marais neighborhood. Perhaps worried that Obama would create an international faux pas by ordering a burger or a margarita (two of his faves), a reporter asked what he planned to eat. Obama was, appropriately, diplomatic: “I will get recommendations from the president,” he answered, nodding in Hollande’s direction. The US federal budget is just over $3 trillion. I'm pretty sure they mean mostly consumer/commercial industry. The global change market is worth that much to companies selling wind turbines, carbon trading ... things, solar panels, etc. If that's the case, that would mean Google, Wallmart, Ma & Pa Yoghurt Shoppe, and your neighbor down the street are a part of that. They might be looking for lower electricity bills and the ability to run the fridge when the rest of the block is without power. Awesome response! Thank you Chaya! First I need to say that I am a fairly liberal hippy chick who rode a bicycle to work in the 70's, 80's and 90's, had solar hot water also in the 70s and 80's and now have solar power on the boat. With all that said, I am amazed that I am once again in 100% agreement with StuM, and even Rich (Third Day). How does that happen. Myself I always look at the data. As someone else here said, to study science, one must look at all the data for and against a theory. I for 3 years now have been more concerned with global cooling. Both the antarctic and arctic Ice are growing. Antarctic ice is growing both on land and sea. Arctic ice is still not recovered, but it's well on it's way to full recovery. Northwest passage sailing, not happening any time soon. Yes both 2014 and 2015 are record hot days. Alas, that's based on statistics and assumptions and not on someone averaging temperature readings. If one were to read the appendix for the 2014 report, it really only had a 30% chance of being the hottest on record. Nasa adjusted the seabouy data this year which is why 2015 is the hotest. Both Noaa and Nass have trended to adjust old weather data in that it always showed a warmer current climate. The adjustments neve made it cooler, how odd. Meanwhile, we had record cold temperatures last year and the year before, least for the US and Canada and Russia. While the various weather models show rising temperatures, actual non-adjusted temperature readings are actually showing a overall decline with average temperature over the last few years. It was always been my contention that solar flux played a huge part in earth climate. No everyone shares that thought. Yes it's hotter now then in the 1850's, but the weather was rather nippy back then with the Maunder Minimum and the little ice age. I suspect but hope I'm wrong that things are heading for another cooling period. But hey, I have a boat, so if it gets too cold, just head south. To warm head north. easy peasy. Got to keep the thread on that sailing track you know. With all that said, I am amazed that I am once again in 100% agreement with StuM, and even Rich (Third Day). How does that happen..
You must be either a programer or an engineer. How you think is obviously steeped in logic with the ability to analyze systems. When I was in elementary school I read Lenin, Das Kapital by Karl, The Selected Works of Mao Tse Tung (all 10 volumes) etc, etc, etc. When asked in Junior High by a teacher, what I wanted to do in my future I said I wanted to found a commune. I should have realized that I had ambition because I didn't say I wanted to live on a commune but I wanted to be the founder. The uno numero like my socialist leaders that I admired so much. But life happened. I founded a software company when I was 18. Sold it for a disgusting large sum of money 2 years later. So I learned I could create my own little world by making my own businesses. Funny how far removed I was from my earlier dream of founding my own commune. I was always 'socially aware". A true idealist who wanted to build a better world but also wanted a better world for myself. So my life became a mixture of working for the common good while working for my own good. During my learning in high school and beyond I took an interest in reading all views on economics. I also studied psychology with a particular interest in neurology, social behavior and human motivation. It is these areas of study that lead me to build my knowledge base beyond my pre teen and teenage years of communist influenced idealism. I came to learn that Mr. Marx was over simplistic and did not take into account many things such as differing human motivation and desires causing differing economic outcomes. His view of the relationship of labor with capital of being that of basically theft of the labor of workers by those who used capital to under reward those whom they enslaved (hired). He failed to take into account the complexity of the worker and boss relationship and that if outcome was equalized for all then those who were lazy would be the ones who would in effect be stealing from those who worked harder. The point I am making is that while some would look at me now as a filthy capitalist but I am far more complex as most of us are, then what would be obvious from the opinions I have come to form over time. I still think in a non conformist way and that is a great thing. It has allowed me to invent and create things that others didn't think of. Then I have used my knowledge of human nature and motivation to build businesses and teams of motivated people which in turn has made me a successful capitalist. So I care for the planet. I want clean air and water. I don't want to perish because of the cold or the heat. But I am able to think clearly. Logically and given my life of study I am able to see propaganda and social manipulation from a mile off. So like you, the data that I have read is also leaning me to think we are entering a cooling period brought on by slowing solar activity. It would be interesting to know what the temperatures were like near the equator around 1850. This will tell me wether I need to have a lot of anti-freeze on board or sun tan lotion. But I digress. When one is trained to think clearly and logically and then one also is prepared to input and analyze available data one can arrive at their own sound opinions on a subject. Those who are not so capable or willing to put in the time and effort are at the mercy of those who want to control the agenda and have you think what they want you to think. So we may indeed see a major drop in temperatures these coming years. I am absolutely sure that this winter in the USA will be just as bad as last years if not worse. Very cold with a lot of snow and a much later summer. We could see an increased demand for offshore sailboats as more and more people discover the advantage of being able to relocate your water based home wherever the sun shines best. Downloaded. Not sure when I'll get to reading it, but, believe it or not, I am open to logical and rational discourse. I will also read this, with a heavy dose of skepticism. Based on the website, and the agenda of the other articles at first glance, I am confident I am going to not be satisfied completely that this is fully objective on the subject matter..but it is more information..and to me, that is just as valuable to frame the problem. I will leave with this final comment...with the governments failed attempt to use tax payers dollars to fund syllandra, a few years back, I have no confidence the government has any credibility in forming any type of functioning realistic durable solution on this matter. It has become a fear tactic to drive the political branding, and potential tax burden program that realizes a type of industry regulation that consolidates economic power. For the hedge fund owners, this is certainly delightful..to the consumer, it becomes another artificially inflated price increase. I've read that Obama and company enjoys a fantastic amount of superpac money from buffet and friends..and in return, it prevents the keystone pipeline xl program from going forward. apparently, buffet own a major stake in rail based intermodal transportation for a vast percentage of the bulk oil transportation business in america, supplying a large number of production and cracking plants in the gulf states, west and east coast as well. Apparently, the addition on a major addition of the keystone pipeline would create competition that essentially results in buffet and investor from losing about 2-4 billion dollars a year, in revenue. nevermind that pipeline movement of bulk oil IS more efficient and cost effective. It's what I've read..it makes the political elements more than suspect, when you take this all in. Conspiracy..perhaps...big corporations don't like those terms. they call it lobby power. Yea, I noticed when I got up today is was around sixty three degrees, then this big yellow thing came up over the horizon and it started to warm up. It got up to around eighty degrees and the big yellow thing went down behind the horizon and it started cooling off. Funny thing is this seems to happen every day around here. Not everyone is in agreement about how much the sun's output varies. Back in the day I was a huge fan of Willie Soon and well before there was any talk of global warming I was reading his books as he was the go to source for solar research. Also have to point Stuart Clark wrote my favorite book about the sun, The Sun Kings which is the story of the 1859 Carrington Event, which was during the sun's most active period in modern history. Clark details not only how Carrington was the first person to photograph a solar flare, but also how solar astronomers at the time were using sun spot frequency to predict wheat crop yields for speculators at Lloyds. In more recent times sun spot frequency has been used to predict the el nino la nina cycle which affects the sardine catch in the Pacific. Sardines are a substitute for soy beans used in live stock feed so a big sardine catch means short soy beans and a small sardine catch. This was a good gig for solar astronomers. What has changed is now there is a better gig being paid for by tax dollars on one side and corporations on the other. I am just glad I have a nice solar array and battery bank to run my Frigabot and Engle to keep my food cold and ice in my drinks as well as run my AP and instruments. Just hope my 250 feet of chain and 150 of nylon is enough is the sea level does rise. Imagine a surgeon giving you a diagnosis that calls for radiation therapy for advanced stage lung cancer. you ask him, of course, how he came to that conclusion, and he tells you, he used a technique that requires that he hook you up to a monitor that test for abnormal cells. you reply, ok, can I see that Xray charts of my chest. he says: we don't use them here..we prefer to use a different technique, that is "just as good". then you ask, did you test a sample of tissue...can I see the lab report of the biopsy. he says: we did not perform that either..we prefer to use a different technique that is also "just as good". you press him further: you do have an Xray capability and a lab that can process tissue biopsy samples, no? he says, of course we do, we have THE state of the art technology at our center, the best imaging devices, the best lab equipment and the greatest talented pool of experts in the world. we spared no expense whatsover, in developing all of those things. so, you press a little further: can you explain why you choose not to use them...and can you explain specifically HOW you have come to KNOW that using these "other" techniques that you used is more accurate and realiable? and now, here is the story. "In testimony before the House Science Committee, NOAA’s deputy administrator, Manson Brown, made similar remarks, noting the importance of satellite data. He said that NOAA’s ability “to deliver environmental intelligence starts with keeping the pulse of the planet, especially the atmosphere and the ocean, and this is the central capability where space-based assets come into play.” So why does NOAA leave out satellite data when it releases climate projections? Atmospheric satellite data, considered by many to be the most objective, has clearly showed no warming for the past two decades. This fact is well documented, but has been embarrassing for an administration determined to push through costly environmental regulations." Are you sure about that? As I understand it it's the same old data, just "new methodology" to adjust early data down and recent data up yet again. "In contrast to version 3, ERSST v3b does not include satellite data, which were found to cause a cold bias significant enough to change the rankings of months." The paper, "Improvements to NOAA's Historical Merged Land-Ocean Surface Temperature Analysis (1880–2006)," describes the update from ERSST v2 to ERSST v3, and both in situ and satellite Advanced Very High Resolution Radiometer SST data are included. The current version (ERRST v3) has satellite SST data not included in previous versions. However, the addition of satellite data led to residual biases. The ERSST v3b analysis is exactly as described in the ERSST v3 paper with one exception: ERSST v3b does not use satellite SST data. The ERSST v3 improvements are justified by testing with simulated data." disclaimer: I don't hold claim to an opinion one way or another with respect to the choices that NOAA has made to "discount" satellite data. However, it captures my curiosity, why they would make this choice, as the established general opinion relates satellite imagery and sensing as the most robust, thorough, and complete type of data. I do agree with alternative energy though... It's time.